Dimensions 0.50 by 6.75 by 9.50 in. 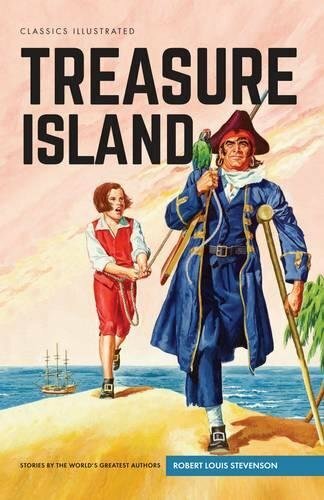 Amazon.com description: Product Description: Stevenson's tale of young Jim Hawkins, aboard the ship, Hispaniola, and the devious ship's cook turned pirate, Long John Silver in his hunt for hidden treasure. Classics Illustrated tells this wonderful tale in colorful comic strip form, offering an excellent introduction for younger readers. This edition also includes a biography of Robert Louis Stevenson, theme discussions and study questions, which can be used both in the classroom or at home to further engage the reader in the story. The Classics Illustrated comic book series began life in 1941 with its first issue, Alexandre Dumasâ "The Three Musketeers", and has since included over 200 classic tales released around the world. This new CCS Books edition is specifically tailored to engage and educate young readers with some of the greatest works ever written, while still thrilling older readers who have loving memories of this series of old. Each book contains dedicated theme discussions and study questions to further develop the readerâs understanding and enjoyment of the work at hand.